We are very excited to host the second GPSS Academic Conference specifically for and by graduate and professional students on April 19th. 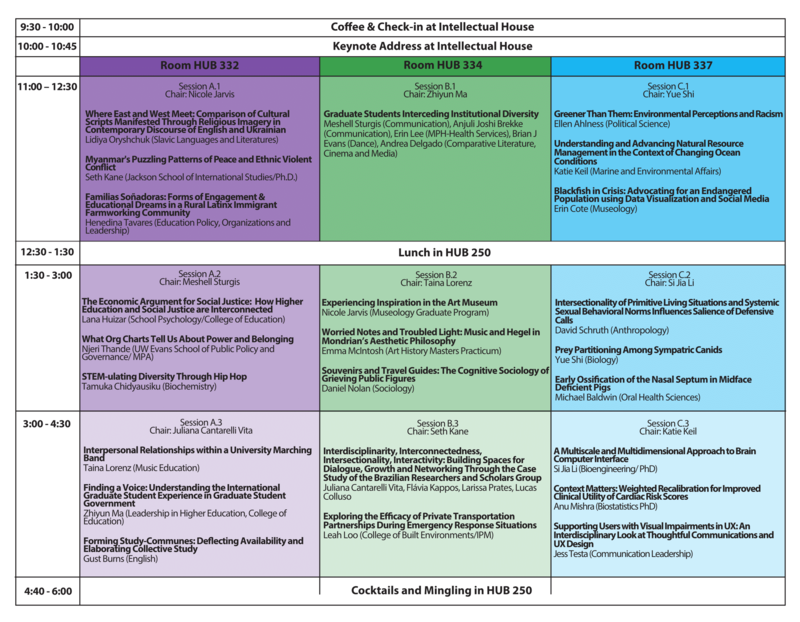 The conference will be hosted in the HUB with the keynote presentation in the Intellectual House. 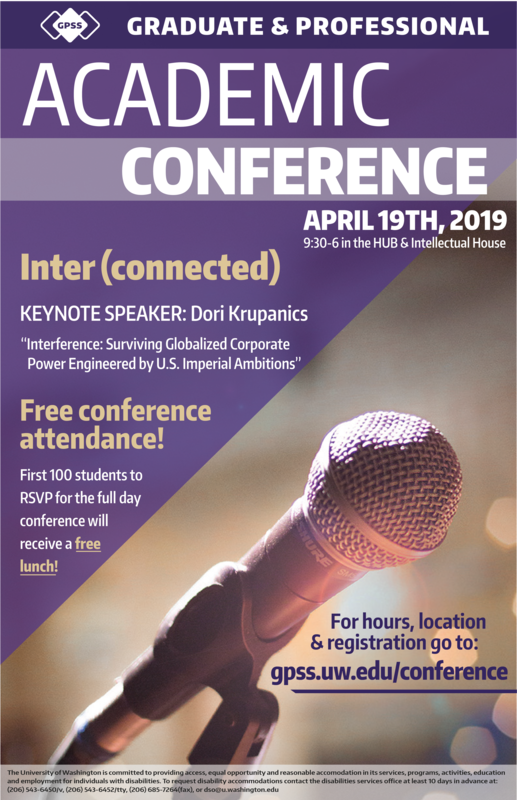 Attendance to the conference is free for all UW students, faculty, and staff. Coffee and snacks sponsored by the Graduate School will be provided in the morning and a reception will follow at the end of the day. 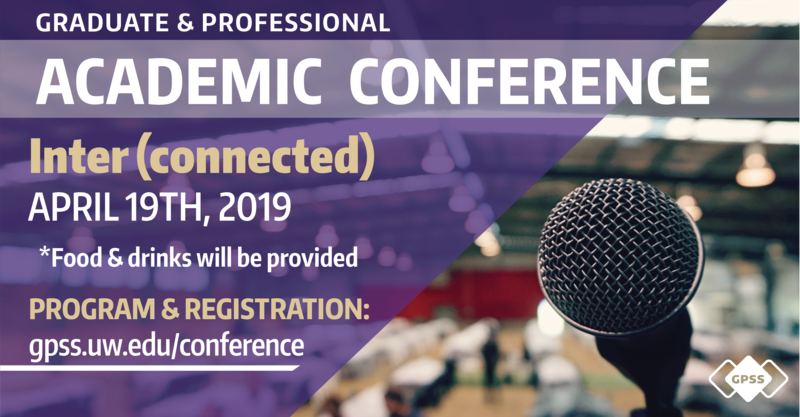 Free lunch sponsored by Student Life will be provided to the first 100 graduate and professional students that register for the full day conference using this link. RSVP to and share the facebook event! The idea is to encourage not only interdisciplinarity, but outside-the-box scholarship, with an open-ended prefix (inter-) that can motivate uncharted scholastic territory. Another hope is that graduate and professional students take this opportunity to push the boundaries of their fields, especially when topics they want to cover may not be warmly accepted by traditional conferences in their respective fields. We want to promote connections across people, disciplines, and minds. We also want to question paradigms and structures that perpetuate oppression and barriers which affect not only our personal lives, but our professional and academic experiences as well. There is not always space for these conversations. Therefore, this conference theme is an invitation to contribute thoughts, research, and perspectives related to race, equity, and social progress. 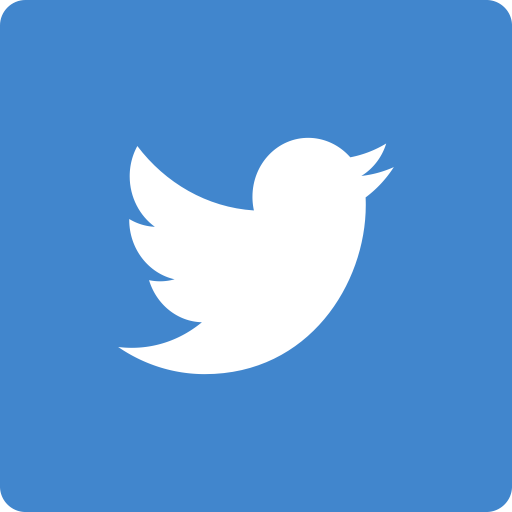 “There is a disconnect between the truth and what is disseminated. I would welcome the opportunity to speak about where this separation stems from in an otherwise very interconnected world. Historical interferences can explain this paradox; one currently executed by the United States. Underneath the façade of American exceptionalism hides a different kind of patriotism: international interference through US corporate power. This meddling, one that is not unique in world history, continues to exploit human beings globally. Therefore, it is imperative that we pay close attention to the development of corporate law that is interconnected with US foreign policy, forging ahead in its imperialist aims. We acknowledge the people – past, present, and future – of the Dkhw’Duw’Absh, the Duwamish Tribe, the Muckleshoot Tribe, and other tribes on whose traditional lands we study and work.